July 16, 2007, L. G. Crabo. 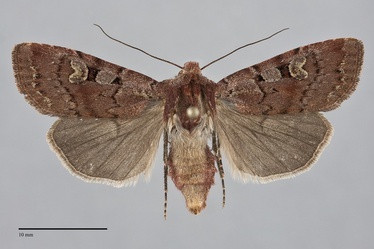 Euxoa lewisi is an attractive dark red-brown medium size Euxoa (FW length 15–18 mm) with black markings, usually including the cell between the spots, that occurs at middle to high elevations. The forewing color is usually dark red-brown, less often with an orange or gray tint. The terminal area and fringe are slightly lighter. The cell is often filled with black. Some specimens are slightly gray-tinted, appearing slightly purple, on the anterior wing near the cell. The basal, antemedial, and postmedial lines are gray, partially double with components of unequal strength, filled with the ground color, often very faint. The basal line is slightly irregular. The antemedial line is evident as paired gray spots on the costa and is more variable elsewhere, often visible at the base of the claviform spot or across the entire wing; it is weakly to moderately angled toward the outer margin and slightly irregular, often with a strong tooth toward the base on 1A+2A and a bulge toward the outer margin below this vein. The median line is dark gray, diffuse, usually moderately dark even if the other lines are faint but sometimes obsolete except on the costa. The postmedial line has a strong inner and very weak or absent outer component, evenly toothed on the veins, drawn toward the base on the costa, bluntly curved around the reniform spot, and angled 45° toward the base below the spot. The subterminal line is powdery ochre, complete or broken into small diffuse spots, preceded by a slightly darker red or gray shade near the costa. The terminal line is thin, dark. The orbicular and reniform spots are partially outlined with outer black and inner powdery ochre lines and both are moderately large. The orbicular spot is oval, open toward the costa, filled with the ground color or purplish gray. The reniform spot is kidney-shaped, filled with the ground color and variable amounts of powdery ochre. The claviform spot is black, often absent or incomplete, small. The head and thorax are the same color as the wing without dark markings. The male antenna is strongly biserrate. Euxoa lewisi is a member of the subgenus Pleonectopoda, characterized by a subbasal coil of the male vesica. This is only apparent in males in which the vesica has been everted and inflated. This species can usually be identified by its montane forest habitat, slightly glossy red-brown color, and black-outlined spots with powdery yellow peripheral filling, and a collar that lacks a black transverse line. Specimens with black in the cell are most distinctive. It is only likely to be confused with Euxoa divergens, Euxoa trifasciata, and Euxoa excogita, other red-brown species with which it occurs. Euxoa lewisi lacks pale cubital and radial veins that are diagnostic of E. divergens. It usually has a more complex pattern of lines and spots than the other two moths. Euxoa trifasciata is dull dark orange-brown with black transverse lines as the dominant feature. It can have light lining of the reniform spot but lacks the yellow subterminal line of E. lewisi. Euxoa excogita is even more uniform red-brown and lacks large spots with dark outlines. Euxoa divergens and E. excogita have strong black lines on the collar, and E. trifasciata has a weak one. 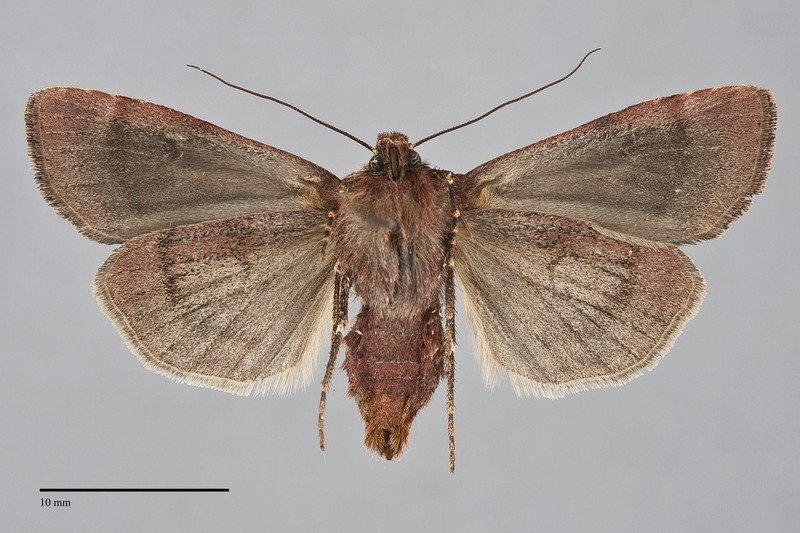 The type locality of the synonym Agrotis colata Grote is Mt. Hood, Oregon. This species is widely distributed in high elevation subalpine meadows and forests throughout much of western North America. In the Pacific Northwest, it is common in subalpine spruce-fir forests and meadows, although it can also be collected in traps placed above timberline. This species is considered to be management sensitive, depending on disturbed openings and meadows in the forest. Euxoa lewisi is found in the mountains of southern British Columbia and north-eastern Washington, and in the Cascade Mountains as far south as west-central Oregon. It probably also occurs in the Rocky Mountains of Montana and Idaho. This species is also found in the Rocky Mountains from southern Alberta to Utah and Colorado, and as a disjunct population in the Sierra Nevada of California. The adults are flying from late June to mid-August in the Pacific Northwest. They are nocturnal and come to lights.